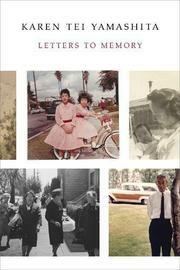 A multilayered evocation of Japanese internment camps as experienced by the author’s extended family. The thematic ambition of this project transcends category. It isn’t quite memoir or even the memory of stories told by earlier generations. Title aside, it isn’t a collection of letters, though such an archive spurred Yamashita (I Hotel, 2010, etc.) to feel she could become “a useful repository of the past.” She quotes the letters sparingly, and most of the longer letters are hers to readers or her editor. It isn’t quite a scrapbook, though there are plenty of family photos, renditions of artwork, and shards of manuscripts. The narrative is part research, part history, part literary criticism, part spiritual meditation, and part open wound. “Stories blossom, as a kaleidoscope, a space where events aggregate in infinite designs,” writes Yamashita, who has toyed with form in her much-lauded fiction. Most of these stories are ones she has read in the letters or maybe heard from her parents (her father was a pastor), but they become very much her stories in the telling. “For you, the problem is to separate the fiction from the fact of living,” she writes, addressing “Homer,” though perhaps writing to the reader or herself, “to excavate the origins of our attachments to meaning, the material forensics of human systems, the fork in the road where we could have taken another path. This is the work of history.” This is certainly interpretive history that illuminates the tensions within the Japanese community in America over the war with Japan and the ironies of a country outraged by German concentration camps subjecting the Japanese in America to similar treatment. Shaped and voiced with literary flair, this is clearly a book Yamashita felt compelled to write, and her sense of purpose makes this historical excavation feel deeply personal.